Most of you would be familiar with the combination of roasted pumpkin and halloumi cheese, you’ve probably seen it on numerous cafe menus. But did you know how brilliantly these two ingredients combine with black beans for a vegetarian fritter out of this world? I have this thing with black beans at the moment – don’t you? I keep finding ways to use them in place of some of the other more common pulses like chickpeas and kidney beans. And I reckon they are perfect in these vegetarian fritters. I prefer to plan ahead and use dried black beans because they taste better. And unlike the canned variety they aren’t as mushy. But I guess if you were short on time and needed black beans fast you could use a can of pre cooked black beans, plenty of stores are stocking them now. One of the common mistakes with fritters is not having them bind together properly, then they fall apart in the pan as they cook. This is not the case with these fritters. Roasting the pumpkin helps dry it out, and the halloumi cheese with its delightful salty taste and familiar squeaky texture adds a necessary firmness. This is also achieved by the addition of egg and chickpea flour to bind it all together. So what’s the best way to serve these fritters? There’s several options: In a burger. Broken up and rolled into a wrap. You might eat them with salad or steamed vegetables. There’s so many ways to enjoy them. But of all these ways, I highly recommend eating them with a squirt of hot chilli sauce, a dollop of sour cream, and a squeeze of fresh lime. Oh, and don’t forget the mild pickled peppers. Place the beans in a bowl, cover them with cold water and soak for 12 hours or over night. The following day, pre heat oven to 180C. Drizzle the cut pumpkin with oil, season with salt and pepper and roast for about 45 minutes, or till soft, set aside to cool. Meanwhile, drain the pre soaked black beans, place in a medium sized pot, cover with water and cook till just soft (about 25-30 minutes). Drain and rinse briefly under cold water. Take 1/2 cup of the cooked black beans and set aside for garnishing. 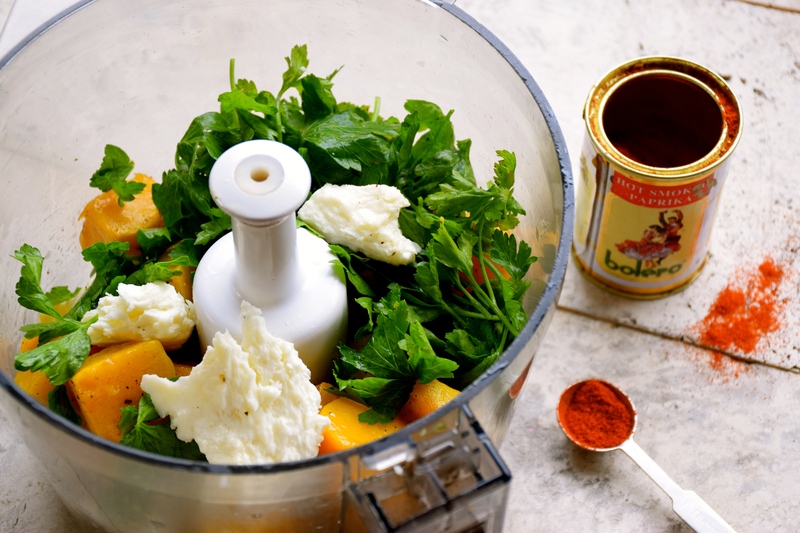 Place the roasted pumpkin, torn haloumi cheese, picked parsley and smoked paprika in a food processor, blitz till just combined. Transfer mixture to a large bowl. Place the remaining cooked black beans (minus the 1/2 cup) in the food processor and lightly blitz, till the beans are broken up but still chunky. Add the beans to the pumpkin mix. Add the egg and 1/4 cup chickpea flour. Mix till well combined. Place 1/3 cup chickpea flour and 1/4 cup sesame seeds in a flat tray. Shape the fritters in to 10 rounds and dust each fritter in the flour and sesame seeds. Set aside. Heat a large non stick fry pan with a shallow covering of rice bran oil, cook the fritters in two batches, on a low heat till golden on both sides. Repeat with remaining fritters. Take the reserved 1/2 cup of black beans and season them with chopped fresh chilli, lime juice and sesame oil. 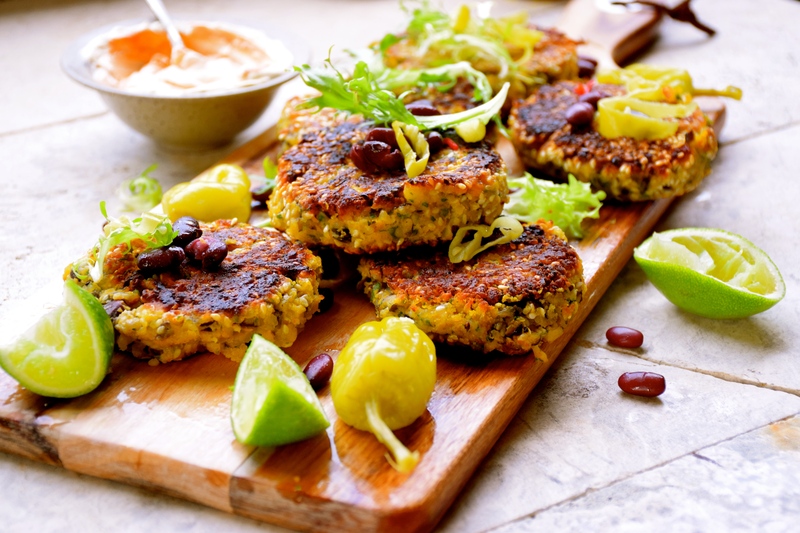 You can serve the fritters on a platter, scatter with the reserved black beans, pickled mild peppers and serve with sour cream and chilli sauce. Heh, your wife will love them too. I’m eating them now in a wrap, so good. Thanks Brendon. I’m loving the new look of your site. Nice one. These look wonderful – beautiful combination of flavours and your photographs are stunning. Oh my these look good! When my husband was a vegetarian, I made many different kinds of meatless burgers, and you’re making me want to begin doing that again!!! That’s great Mimi. When I ate only vegetarian food for four years, I too made this type of fritter all the time. And now-a-days, even though I’m back to eating meat, I still crave and go crazy for a good -meat free – fritter.